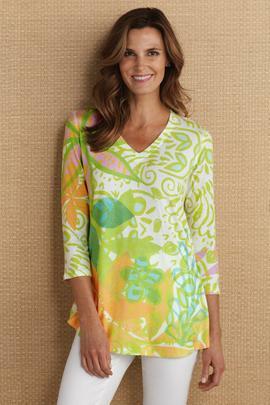 Universally flattering, women’s 3/4 sleeve tops are a specialty here at Soft Surroundings. Available in a range of fabrics, colors, and styles, you’ll be able to find the right garment for any occasion.This collection includes knit tees and tops that are incredibly versatile. They pair wonderfully with denim or you can dress your top up by wearing a skirt. 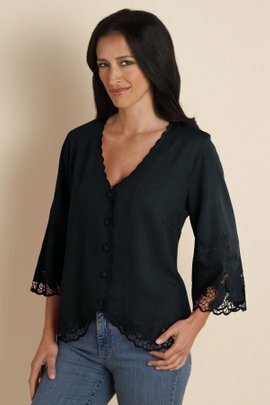 The same holds true for our ¾ sleeve tunics, which can also look great over leggings.Many of these tops and tunics also feature unique details, such as embroidery, beaded embellishments, and hand carved buttons. They come in a rainbow of colors ranging from soft neutrals to vibrant, deep teal and burgundy. Of course, all of these tops are incredibly soft and you can always check the softness rating so you'll know exactly how comfortable you can expect to feel when wearing one. Browser collection and treat yourself to something beautiful.